Die Antworten auf meine Fragen an die SEAT Experten zum Leon ST › "Auto .. geil"
Mein Frage: Hello, Guten Morgen. When you were drawing the first sketches of the new Leon ST, which other design elements, objects had an influence on your work? You know, for getting inspiration we don’t get or I don’t get inspiration particularly for any object. It’s more about the experience you have or the things that you find by chance in a daily basis activity. So everything that you get, it could be exhibitions, it could be just walking around the city or looking at people how they use cars, I like that, just driving on the motorway and looking at the different cars, you get ideas, you get things coming to you a little bit like water coming into a sponge and all that it has to be worked out in your brain and then when you sit down to draw somehow this alchemy it’s working and then it goes into the paper. Sometimes, yes, you should find an object that maybe inspires you especially but it’s quite hard after to translate it to a shape so it’s more a state of mind, it’s more let’s say your experience as a person, it’s more that curiosity that you have to see things around you. frei übersetzt: Die Inspirationkommt für mich nicht von einem oder mehreren bestimmten Objekten. Es geht mehr um die Erfahrung, die Sie haben oder auch die Dinge, die Sie durch Zufall im Alltag erleben. Von Ausstellungen, einem Spaziergang durch die Stadt oder auch von Beoabachtungen wie andere Menschen ihre Autos bedienen. Es gefällt mir, einfach beim Fahren auf der Autobahn verschiedene Autos anzusehen. Dabei bekomme ich Ideen. Manchmal sieht man auch ein Objekt, das dich besonders inspiriert, aber es ist ziemlich schwer, dies dann einer Form am späteren Auto zuzuordnen. Die Formen kommen dann mehr aus Erfahrung als Person, ist es mehr die Neugier, mit der ich andere Objekte betrachte. Mein Frage: I have a very specific question from one of my readers. He is wondering as the Leon ST comes with 17 inch alloy wheels, is he able to put 19 inch on it and what is the biggest size you can put on? Michael Hinz Okay, this, to be precise, I cannot answer this precise, it depends, for example if you have a snow chain, chains then you are limited but 19 is no problem and of course we will offer in aftermarket or from SEAT Sport bigger wheels even. The problem always is that you have to reduce the travel. Of course in a very sporty car, and if you want to drive very sporty then you can reduce the way of travel, but as a car for all customers this is basically the limit up to 19 inch and the alloy wheel we start with 16 inch wheels here. frei übersetzt: 19″ Felgen wird man am SEAT Leon ST aufziehen können. Es ist nicht auszuschliessen, dass SEAT sogar größere Felgen für den Leon ST anbieten wird. All right. It looks like everything is ready to start. Ladies and gentlemen, good morning, boys and girls, everybody and welcome to SEAT here in the Frankfurt motor show. On behalf of our communications team and the marketing team members I would like to say thank you very much for joining us here and to be here with us on a special occasion: the world premiere of the new Leon ST.
My name is Antonio Valdivieso and I currently deal with brand and product communications. For me it is a real pleasure to have the opportunity to share with you the novelties of the new Leon ST. This car is about design and this car is about technology; this is a nice combination of a beautiful design, a design that represents, a car that represents the SEAT brand values and an extraordinary performance, functionality and technology. So on this occasion, to talk about the car that is not a name; Leon is not a name any more that represents only one car but it has become a real family. The Leon ST together with the five-door version and the SC version, now the three of them are a family and for as it is a special occasion because of that, because the name Leon does not stand for a car any more. The Leon its now an entire family. So as I mentioned before this car is about technology, this car is about design and for that today we have with us a director of design Alejandro Mesonero and our technical project manager Dr Michael Hinz. They will walk you through the main things on design and the main things on technology and for that we have prepared a short presentation, right? Each one of them will talk to you about the design and technical particularities of the car. And after that you will have the opportunity to ask your questions and say your comments, and for that we have not chosen the standard alphabetical order like we normally do. So we have done a little draw, an internal draw, and I will assign a number to each one of you and at the same time I will say hello to Edoardo from Italy with the number one, who will start the Q&A round after Mr Alejandro Mesonero finishes his speech, then will come Rui from Portugal with number two, Scott with the number three from the UK, number four Jan from Germany, number five Carlos from Spain, Moritz from Germany as well number six and finally, last but not least, Josep from Spain. Then after that Michael Hinz will do a short introduction of what his important role SEAT and then we will do it the other way round, that means Josep will start, Moritz will follow, Carlos, Jan, Scott, Rui and finally Edoardo will finish the Q&A session. So once again a pleasure for me to be here with you. We are going to have fun, we are going to learn within the next minutes and Alejandro, I would like to pass the microphone to you, thanks for being with us as well today and please go ahead. Good, thank you very much Antonio and good morning to everyone. Welcome to our SEAT stand and I would like to go with you through the new Leon ST, our latest release from the family, from the Leon family. As you know we had already presented the three-door Leon, the SC, the five-door, and then this is the third car of the family, it is the station wagon. You can appreciate in the images the front end of the new Leon ST, it shares the face with the rest of the family. It’s a face you know it now very well because it is on the roads everywhere, it’s a face that inspires, that reflects character. We believe that a car has to be, has to have a strong character of emotion, it has to have this strength of the person that knows what he wants, especially around the eyes, what we consider the eyes of the car which is the headlamps, and then we have been concentrating very much to give this expression of self-confidence, of good technology in, let’s say, wrapped in a nice design. So it is an excellent face, the new face of SEAT and then the novelty is actually on the rear. So if you come with me, I would like to show you what we have done on this new Leon ST.
Basically you know that when we started the project we were asked, and this was the challenge, how to make a family car to look good, to look seducing. Because normally, you know, family cars or station wagons they’ve been, maybe, they’ve been designed or people think that they’re a little boring. Therefore the family have to make a compromise; you can’t have a very nice car when you buy an ST, a station wagon. And then the challenge was to make something that look really good. What have we done? Basically what we have done from the B post towards the rear, it’s everything new. We really worked on the proportions of the car to make it look sporty to have a good stance, then we have done a sloping roof towards the rear to give speed to the vehicle and a really good angle on the rear not too vertical, not too inclined because it has to be practical, this is very important, and then we have the right amount of rear overhang on the rear. Not too much, not too little, then again the name of the game was to keep a good level of practicality with a nice design that is emotional and that will attract people. As you can see also we have emphasised the sheet metal around the pillar, we make the car to look really well seated on the wheels and it has some muscle, it is not flat, it has shape all around. All the lines on the rear they are quite tight as you can see, precise, this is the kind of line we have all around the car: very precise, very sharp, very visible. We have also this time a line that is not in the five-door or on the SC to actually reproportion the boot in a better way, since the loading height is lower than on the five-door. It’s lower because in a family car, in a station wagon, you bring in more goods probably more often, or bigger, than in a five-door; so always, the challenge then again was very much to keep the practicality of an station wagon but allow the client to really be in love with the car in the first time, and then discover that it is also very practical. Actually, we have one of the biggest boots in the segment. I think actually that the most interesting part’s going to be your questions, so I will use the time now to listen to them and then try to answer in the best way so I’m all yours: you can ask me now whatever you feel. Good, good Alejandro. Thanks, thanks a lot. Then we said we gonna start with Edoardo, from Italy. Please, go ahead Edoardo. My question, we know that the design of the vehicle has a specific social meaning, for example rounded lines are synonymous with safety or angular lines are synonymous with aggressiveness, but how much social trends influence the design of the car in particular of this car. Social meaning, social equation, some period people need safety in the other period of people need the sportiveness, aggressiveness, so the designer thinks about this or not? Yes, listen, part of our job is actually to answer to the people needs, so we have to be very open, we have to listen to the people, what they want, what they don’t want and when we were designing the ST we actually realised, on my own experience also, is that sometimes you want to have a nice station wagon because you need space not only for the family but also if you want to transport your bicycles or all your surf, you need space. So this is a real need of the people, and then comes the fact that some of the people they say okay, listen, yeah, you know, I really like the sportivity of the five-door but I need the practicality of that, so how we combine it and this is the whole, the whole game for us and the challenge and the fun of it to combine, which is not easy because we have, you know, a lot of practical parameters that we have to keep like for instance the entrance of the boot has to be wide enough to bring big objects when you go to buy furniture because, you know… So this is all what you have to combine, so the social aspect and to think about the people is very important. I consider sometimes designers a little bit like the people between the pure technique and also the client. We make sure that the technique or the technology will make it attractive to people. Okay Alejandro. Thanks a lot, let’s jump now to Rui from Portugal with number two, Rui, good morning. Good morning, hello, you’re welcome. Thank you for the invitation. Alejandro, you didn’t show the panoramic sunroof I don’t know if that car is equipped with it. Can you show the main challenges or the main design features that it has? Actually, you know, obviously the panoramic roof, you get the most of it when you’re at the rear, I think it’s very important, it’s not a specificity of station wagons, I think, obviously the roof is longer so we can make it bigger, but I think in any car and on the five-door and three-door we have also panoramic roof, it’s really nice to have the light, the lightness that offers you a panoramic roof. Since this car is maybe more intended for families to have children at the back I think it’s excellent, they have fun looking at what’s going on, the sky, and it gives you light, it gives you space, it’s really really nice. From the design point of view there is no any specific constraint to design a solar roof, a panoramic roof, it looks really also good from the outside. Good. Number three, Scott Fulton from the UK, good morning Scott. Obviously, well, as enthusiasts of the brand we’re really excited to see three models of Leon it gives us that assurance. Interesting question though, in terms of the model line-up now do you see this as a replacement for the Altea? Where does that kind of set in your future plans compared to obviously having a state now. You know, the Leon family is a quite big family already. We had before a Leon that had to do many jobs at the same time, with three-door, five-door, station wagon, so it was quite complex. Now we’ve found a specific use for each body, for each need for the client, we have the three-door which is sporty, the five-door that is also very sporty but it has more room inside, and then the ST which to me looks absolutely fantastic in terms of proportions: it looks sporty, it looks capable. What’s next? Next you’ll see this family growing up, of course, there’ll be more versions and we’ll show you these really soon and then also we believe that we have an Altea that’s really a nice car. It’s a very nice MPV, sporty, it has the values of Seat. The car still goes very well. It sells very well. We gonna continue with it obviously because it’s nice and then we’re working on several projects options to replace Altea. Basically what we have to replace is a vehicle that has a very nice design, that has good practicality inside, and a higher seating position, so we’re working on that and hopefully you can see things coming in some time. All right, okay. So now we turn to number four, Jan Gleitsmann from Germany. Guten morgen, Jan.
Hello, guten morgen. When you were drawing the first sketches of the new Leon ST, which other design elements, objects had an influence on your work? Thanks Alejandro. Now we turn to number five, Carlos from Spain. Good morning, buenos días Carlos, adelante. Carlos, can’t read you. I can’t read you. Ahora sí adelante, buenos dias, Carlos. ¿Siendo la versión familiar, qué sistemas de seguridad destacaríais? The safety system or the safety items we have on the ST actually are shared with the five-door so we have a full range of airbags inside and then there is no specific security item on the car. It has all what the five-door has, or the three-door, all the airbags and then same thing. Obviously it has more overhang so I guess in case of a rear impact you have more sheet metal to deform but there is no specificity on that on the ST. Okay, so let’s go back now to Germany with Moritz Nolte. Guten morgen Moritz. Hola and good morning from Germany. 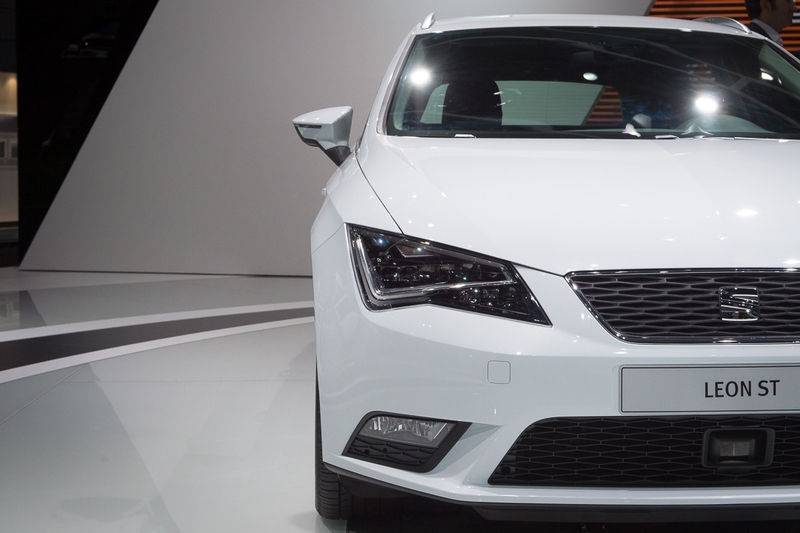 Our reader too asks the carbodys SEAT Leon and the Leon ST, they have edges. Is that to look sporty and how does it work in detail? Yes actually the edges are voluntary. I think that a good design or our philosophy is that a good design has to be an extremely simple object, well-proportioned. This is very important and you can see it, in the three Leons that this is what we have done. Beautiful proportions, this is like a human body it has to look good in the proportions and in the suit or the clothes, they have to, you know, so the style of the car, the clothes, they have to suit properly this skeleton, this architecture, this human body. So this is the main thing. Once we have these proportions, actually, we have to do what we call the style of the car and in SEAT we voluntarily chose lines which are very sharp, sharp because it shows precision, which is one part of our DNA, we are part of the Volkswagen group and the precision, the quality, it’s one of our strongest points, but also we want emotion, we believe that sheet metal has to provide emotion, has to provide the notion of movement because automobile, like the word says, is auto mobile, it has to move, it has to move even if it’s standing still we want to give the impression that the car is going to be agile, that is going to be nimble when it drives. So you can see actually that the car has very soft surfaces between the lines, the sheet metal has strength with the round shapes, but then you find the sharp lines that you mention, like the tornado line or the blisters, this one, with the triangle that is fading out so it’s like if you are throwing a stone you will see a movement from front to back and disappears so this is exactly what we are doing, we are doing sharp lines that show movement and they show precision. I can tell you it has been extremely hard for designers and engineers, especially for our friends, for the engineers, to have this kind of sharpness, which is absolutely outstanding and it will be difficult to find around the motor show sharper lines like what we have in the Leon today, and sharper corners. So sharp lines with soft surfaces and good proportions, this is our language. Okay thank you, Alejandro, good. Alejandro thanks. Now last but not least, Josep, Josep Camós from Spain. Bon dia company, endavant. Hola. Okay we are talking about design but I would like to go a little further, so okay. Imagine I am a next client and I want to buy a family car but everything I see is SUV. So I see you are betting for a familiar car, a family car. Can you or how can you convince me that the Leon ST is better or interesting or more interesting to me rather than an SUV? Okay the ST or the station wagon as an architecture it’s a different animal of the SUV. SUV gives you space of course, more headroom, and then bigger ground clearance and some of them, not all, they are also four-wheel-drive. So it’s a different, I would say it’s a different need, I really believe that not everyone needs an SUV, SUVs are important they are growing up and as you know, it’s not a secret we are also working in projects on that kind, which they will have to be decided. But we really believe that there is a space for a really nice station wagon for, let’s say, a car that doesn’t need to have more space than already an ST, an station wagon, which is a lot; people, not all people need a four-wheel-drive, and then not everyone needs or wants to be sitting higher up. So it’s, I think, it’s complementary, there is nothing wrong with the SUVs, there is nothing wrong with the station wagons. I think that they are, then again as I said, different animals that live together and it’s a question of choice. Good, Alejandro thanks a lot. Okay gentlemen, if any of you has another, an additional question feel free to ask, otherwise we would just run into the second part with Dr. Michael Hinz. Okay, good so if there are no more questions to ask Alejandro I would like to say Alejandro thanks a lot, thanks for being here and having answered all our guests’ questions and then now we will pass on the microphone to Dr Michael Hinz to talk about the technique, the second big word behind the new Leon ST. Dr Michael Hinz, good afternoon my good friend and colleague. Dr Michael Hinz is the technical project manager at our technical centre in Barcelona in the headquarters in Martorell, in Spain. Dr Michael Hinz has a key role in the development of any project because he’s the guy that looks after every single area of the development of the project. He is, like I said, a key person and I would like him to introduce himself and explain you exactly what his job is. Michael, go ahead please. Thank you. A pleasure from my side being here and explaining you all the new details on the new Leon ST. As to my person, as you can hear in my accent I am German and that is no secret I have my past at Volkswagen and as an engineer I moved over to SEAT where I am responsible for project management. Just to give you an idea what is this I am talking about, it’s like playing football to take just a different picture. If you imagine Alejandro just is one aspect of the car he is doing the design. I have an engine guy, there is a guy from electric, all those guys want to do the best car in the world. The problem is you have to do that together and of course as a brand SEAT we have to be on a very interesting price and therefore you have to keep the money, the time and all those lovely content you have to get that together and to coordinate that and that is basically my role. But I’m here today to explain you more in detail what is the story behind the ST, so I’m talking really about little things that normally you would never see or in the catalogue, of course I will talk about a little bit about engines but just to give you an idea, what is the things we are doing in Martorell. Talking Martorell, we have our own technical centre, the head of the technical engineering centre is Dr Matthias Rabe and we there really develop those cars and we are of course very proud, we are Spanish and we are German. So I will walk you from the front to the back with little things some of the things Alejandro mentioned and I will give you a little bit of the technical content. So let’s start with one of the most beautiful headlamps in the industry which is LED technology and of course it’s not only the design but one of the advantages is that on LED light we have the first basically introducing or we have introduced this in the A segment, you have almost daylight and so this is very comfortable for your eyes driving at night. Technically speaking the light temperature’s almost the same to daylight. Another point and what is the intention behind that is the reduction of electrical energy, you basically can run those LEDs more or less fifteen percent less than a conventional bulb or even xenon. So, here you see a perfect idea, it’s design and technically driven. Talking about fuel consumption and this is one of the things we are very proud on the Leon family as Alejandro mentioned, fuel efficiency is a package. Yesterday I was asked okay what is the engine doing and all that, basically you have to optimise a car in every part you have to of course engine is one part, but we’ve reduced the weight in this car and we are one of the lightest car in the industry, in the segment. Technically how do we do that? We use a lot of warm pressed steel basically, which is state-of-the-art so you can reduce the thickness with the same strength and overall that reduces the weight, which is, and again one of the ideas of Seat, drivability. If you have a sporty, if you want to engineer a sporty car you have to reduce weight. On the other hand we are fond of (…) aluminium and all the other concepts so we really have to do a very smart engineering. This is just a little attention on the LED but let’s have a look, I will turn the car now. Another aspect of fuel efficiency is of course the air resistance. We can optimise the air resistance and this was one of the questions why what is the big difference between a station and an SUV. One of the things, the car is lower of course so to reach fuel efficiency standards it is much easier on this type of car. As Alejandro said those are two animals basically living, yeah they have different ideas behind. But let’s go back to fuel efficiency. One of the things you see here is an edge. You would say what is this for, you see this part basically and this has a very high impact on fuel efficiency, I will just show the flow of air my hand following and here basically you make sure that the air goes up to the roof of the car and that reduces the pressure you basically feel on the front screen. This is just a little example, another example again a compromise between design and technical engineering if you look on of the shape of this beautiful mirror, of course we have the light, as I said, light is important for Seat. We think that light is one of the key elements a customer will see in the future of course, we have the light indicator here but if you look on the shape of the mirror it would look strange at the first glance but imagine or the idea behind this the shape is just that way, that in the case of rain the water walks all the way up so the customer has two effects: first of all you don’t have any rain on your side window and the aerodynamic resistance of the mirrors also optimise. Another little detail is a gap, I know a very little detail, but this really again reduces the drag on the mirror. So this the little details. Going now to the back of the car, I would go a little bit from the exterior and I will talk a little bit also the details in the interior. Alejandro stated and as he said, you know, it’s a beautiful line but from an engineering point of perspective to build this in the tooling you have to do many laps and engineering laps to find a way to do this in steel. If you take a piece of paper at home it’s very simple, you just bend that and that’s it, but this is one big tool and in this tool you have all those soft radiuses and on the other hand you have those sharp lines and to engineer that, that is one of the challenges. At the end of the day this is why I believe this is one of the most beautiful cars in this segment, it is exactly this precision we get into the car. Another element is safety. We were just talking about light weight, light weight also means you have to, on the one hand you build a very light car, on the other hand you want to build a very safe car. Just to give you another example of this idea and how you engineer that is the A pillar. The thickness of the A pillar is one of the lowest in this moment you can see, the one thing basically from a customer point of view you don’t want to have an A pillar. It should be very thin. On the other hand this is one of the key structure elements in case of crash so you have to be very precise in your design to ensure that the cage, basically this part, keeps all the impact forces through the A pillar B pillar and to the C posts. Again a little example of the compromise we find to do a great design with all the technology you demand today from a customer point of view. Now let’s have a look on the back of the car. Like in the front we have those beautiful LED headlights, a little detail again here you see this sharp line, this is not just because it looks great it also has a huge impact on the wind resistance on the car on the back because with the sharp line, you know that from planes, at the end you change the air fluid and therefore you can reduce the wind resistance on this car. Another point, what Alejandro also stated is the big boot you have on the car. It comes with a double floor we just can move this, very simple, and I just can show you imagine you go to Ikea you have those big things or as a father of three kids I know going to the beach you know, sometimes you have to transport things, and a surfboard, whatever and this all fits into this car. Those are the elements and this is what we see in Seat, we are engineering and we are design and of course as we are a dynamic brand, therefore we offer a wide range of engines on this car we will offer also a CNG version of this car and there’s more to come. Panoramic sunroof, we already mentioned, and there are also some assistant systems, radar based, cruise control, lane assistant and all the things which are state-of-the-art you can get as an option on this beautiful car. So let’s have a look in the interior. Basically what we see here is the connectivity we offer at SEAT as we believe connectivity is one of the most important things we will see in the future, and therefore this is one of the key elements we see. On the other hand, what Alejandro also mentioned, clear lines, very sharp design, which basically leads us to the brand values of our brand. One thing we also have to say on our cars you can vary the seat position, the car is longer than the basic Leon so you have a lot of space in the back or all kinds of seating positions for really big guys, small guys as my wife so this is the basic content. As we said it is a family, and it started with the five-door, three-door, now this ST version. One detail, of course this is Leon but we are very proud of that is the design and the clarity. If you look on the door openers, this is the preciseness we really, yeah, this is what we love at SEAT. Finally those other things on the ST as I mentioned. We offer a wide range of engines, CNG and, yeah, there will be more to come. One last thing just getting out of the car, sound also is important for our young customers and therefore of course with the sound system you get a really great package on this car. I think those are the technical highlights, I could continue but I think that if we then walk and go back to the Q&A from my side I am happy to hear your questions and answer. Good Michael, that’s been good, I mean let me tell you guys that I have been around for over twenty years and out of those twenty-two years I’ve been around nine I have spent at the R&D facilities so it’s always been nice for me to listen to people talking about technical aspects of the car. Now Michael let’s face the challenge of answering the questions of our guests today. So, like I said before, we’ll do it the other way round, we’ll start with Josep this time and then Moritz will follow. So Josep from Spain, Motorpasion, please go ahead. What I said we are talking as a family. I am talking more to come means we will, I am talking about engine range and of course technical content, so this is basically the starting point now we are at and let’s say it this way since this is clear, we will come up with interesting engine concepts on this car also. Good Michael, Josep. Now Moritz from Germany Automobil-Blog, please go ahead. Well the next question is concerning the kids. Does the SEAT Leon ST have special child car seat preparation isofix. And other question, let me see where it is, does side windows in the back have a kind of squeeze protection so the children cannot hurt. Yes. Imagine I would come home with this car without this pinch protection, my wife would kill me. So this, yeah, the answer is of course yes, and to give you an idea on isofix, here basically you already see the isofix there is, I’m just getting out of the way, there you can see the preparation on the isofix. So yes clearly this is a children’s car and as a father I can tell you one of the important thing is you can block the windows so basically if the kids are putting the window up and down you can block that as well but honestly this is standard this is nothing special or on the ST, this is simply state-of-the-art. Good gentlemen, now it’s the turn to go to Carlos Merodio from EllasConducen, Spain, adelante. Hola, a la vez que da una capacidad de carga mayor frente al Leon, ¿también gana espacio interior para sus ocupantes? Yes, Michael, Carlos is saying that apart from the fact that the Leon ST has a higher load capacity, does the Leon ST get still a more interior space and capacity as well? Yes, what we just said. The wheelbase is increased by this car just I give you an example. I know I’m a small guy but you can see very clearly this is more than an average customer will need and the seating position is now in the middle, this is one of the ideas, and as I already mentioned, the volume is 1,407 litres, so this is a big value for this kind of sporty car. Good Michael thanks. So the baton goes now to Jan Gleitsmann from Auto Geil or Auto-Geil from Germany. Jan please, go ahead. I have a very specific question from one of my readers. He is wondering as the Leon ST comes with 17 inch alloy wheels, is he able to put 19 inch on it and what is the biggest size you can put on? Okay, this, to be precise, I cannot answer this precise, it depends, for example if you have a snow chain, chains then you are limited but 19 is no problem and of course we will offer in aftermarket or from SEAT Sport bigger wheels even. The problem always is that you have to reduce the travel. Of course in a very sporty car, and if you want to drive very sporty then you can reduce the way of travel, but as a car for all customers this is basically the limit up to 19 inch and the alloy wheel we start with 16 inch wheels here. Good Jan. Now Scott, Scott Fulton from SeatCupra.net in the UK. Scott, your turn. Thanks for your presentation. Just a question I think it has been covered and SEAT have announced that at some point there will be a four-wheel-drive version of the ST coming. Do you have any more information on timescales for that? Well I said there’s more to come. On that topic I will not be very precise, but of course we are part of and we are a proud part of the Volkswagen Group, and the things you basically see in the group, we are always thinking: okay how can we use this and utilise that. On the other hand, now let’s start, we have already a wide range and therefore that is basically it for today. Right, okay, Rui. Rui Agusto, Autoblog Portugal. Muy buenas. Adelante. Muy buenas. As part of the Volkswagen Group and sharing many parts as the platform, what are the main arguments you would mention to make someone choose between Leon ST between a Volkswagen or Skoda Octavia Combi. What do you think are the main things that differentiate those cars? This is one of the questions I like. Why? Of course we take the modules out of the group and this ensures quality, this is clear. If you look on a chassis for example, we will not invent or develop an own axle because of quality reasons, of course investment, engine durability and all those topics. But what we do as an engineering team and we have all that, we have an own engine department at SEAT and chassis department, this is the refining, that is what you would say, okay on a chassis for example, you take different parts but if you change the spring or dampening rate of the rubbers you can totally change the behaviour of the car. Yeah if you do that bad, okay obviously you are doing something wrong but at SEAT we have a long history especially on the chassis department, yeah we have thousands of kilometres we were running to adjust a SEAT as a SEAT. So you will always drive, a SEAT is different than the Golf and if you look for example all the entertainment things, we have a different concept. Yes we are using the same, if you would say, hardware, but at the end of the day for the customer this is a different idea and using different parts gives the car a different character and, at the end of the day, that we could reduce weight because some of the things are not in this car and therefore this is a different package so for me it is very clear a Golf is a Golf and a Leon is a Leon, with very different directions, and if you look at there are of course some compromises which we did but we said okay as a SEAT this is the right compromise to do. Good Michael, that was quite clear. And then finally last but not because of that the least important of course, Edoardo Margiotta, Red-Live from Italy. Edoardo, adelante. Hi. We know that in your group Audi is the player in high-performance station wagon, for example with the R6 Avant, but Leon ST is also sports car in particular with certain engines. What kind of commitment is to combine the SEAT sportiness on a family vehicle like this one? As I said in the range now we are up to 135 kW, we are looking ahead and, as I said, let’s start with that what we are doing now because as the brand SEAT we have now built up two families, we have the Ibiza family and we have the Leon family and we started and you can already get this car you know with under 135 kW which is impressive and with the weight it is a very dynamic car, but you are right, of course, I’m an engineer too, there’s always opportunity, let’s do it this way but these are things we have to discuss, we have to check and, yeah, just start one step after another, this is the idea behind the thing. Okay Michael, thanks a lot. Thanks a lot all you guys as well. So, there is still some time for you. Feel free to ask another question or make another comment if you like before we say bye bye to Michael. Okay I’ve got a technical question. Basically, it’s a radar based system. The problem on a radar system is not the speed it is covered basically over the whole range but we basically cut then at a certain speed, but the challenge for a radar based system is not the top speed is always the lower speed because then you have the challenge, the distance gets very small and this is the critical thing and that is why automatic cruise system is so complex and that is why we do a lot of accidents in the city because we think there is a distance of two metres or three or whatever and you can stop but from a technical point you cannot stop and since the AC system does this and does the measurement this is also from the technical point of view the challenge. But this system goes down to zero so if you follow a car and it stops this car will also stop. This is basically the improvement we see. In the last years the first AC systems they stopped more or less you know they sent a message, no, no, the system is cancelled depending on the company at thirty kilometres and less but this is clearly the future and with the radar system, this is not shown on this car but you will see that on all the automotive cars you will see a radar detection system in front of the car, and this is basically the future because with this you can do a lot of things. Of course, we have a lane assist system, this is tired recognition system, this is everything we have on board. Good, excellent Michael. Anything else guys? Okay please Scott, go ahead. Do you know who, presumably you have an idea of which model and models in the Leon family you expect to sell the most, do you have a kind of order where do you think the ST is going to sell the most, or the SC? I will not say anything about the volumes here clearly, but as I mentioned, the idea is if you look on the figures we are very successful and we have planned a significant amount on the ST because we believe this is a car which basically we missed on the Leon family and therefore, depending on market because STs are very different in different markets. For example, Germany is a very strong market, other countries are not, how I would say that, interested in this kind. You sell them, but at the end of the day the customer decides and therefore we will see. Okay, okay, well thank you very much Dr Michael Hinz, thank you very much everybody. Guys thanks you, nice talking to you. It’s been a pleasure Michael. A pleasure talking to you guys. Thank you. Good. It’s been a pleasure as usual, Mike. Always nice to have Michael, always nice to have you here. So gentlemen, boys, it’s been great, it’s been a pleasure for me to be here with you today to talk about the new Leon ST, the new Leon ST for the company is an important milestone because, as I said before, the Leon is not a single car any more, but it is a family of cars. And then the Leon would be the second strong pillar, we will develop this pillar strong because that will help us to achieve a sustainable future. This car is about design, this car is about technology and we have been with Alejandro Mesonero and with Michael Hinz. So I will take the words of them, the two of them have said there is more to come. I’d like you to stay tuned because there will be more to come. My pleasure having been here with you thank you very much, have a nice day.